Monographs focus on how to apply a specific technology and are intended for practicing engineers..
Textbooks stress understanding of selected fundamentals and applications through numerous examples and exercises and are intended for use in undergraduate or graduate courses in petroleum engineering. Interdisciplinary Titles are written for a multidisciplinary audience, with the goal of promoting collaboration in technology among geoscientists and engineers in the upstream sector. SPE also publishes books intended primarily for practicing engineers, which may be relevant for course adoption at the university level. A detailed outline of your proposed book, which indicates whether you plan a fundamental treatment of the subject for research professionals, an applications book for operators, a textbook, a reference book, or some combination. Where more than two authors are involved in writing the book, please specify which author will be responsible for each chapter or section. English-language writing samples of previous publications; these could include a completed sample chapter from the proposed book, a journal paper, a manual, course notes, or other work that illustrates the intended approach and writing style for the proposed book. Book proposals are evaluated by SPE’s acquisitions staff prior to being submitted to the SPE Books Development Committee. Please ensure your proposal meets SPE’s basic requirements for organization, spelling, punctuation, grammar, and content. Incomplete or unsuitable proposals may be rejected without consideration. Usually, you should receive feedback or a decision from the committee within 60-90 days. 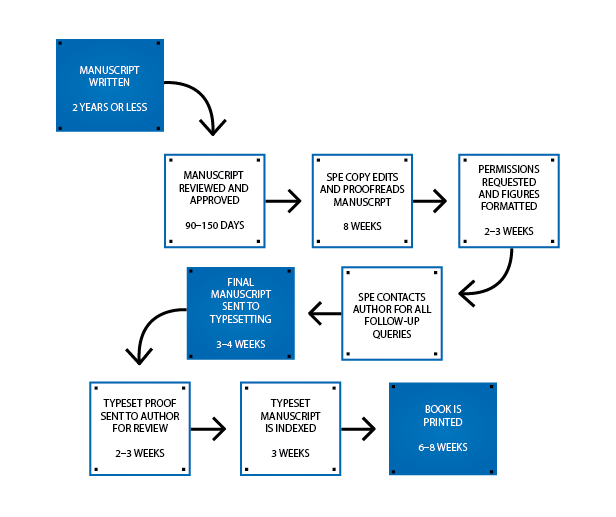 If your proposal is approved, there are several additional steps involved in finalizing the publication process, as noted in the chart above.